7.7 oz of Italian whole black summer truffles in a jar. Imported from Italy. The abundance of black truffles during the summer season results in lower price points in comparison to the winter varieties. The pungent flavor of black truffles is more subdued, but the Summer variety has a mouthwatering sweetness that some have described as “chocolaty.” These truffles, which are in their whole, natural form and brushed (free from any soil). 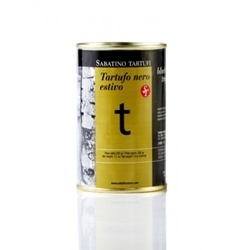 You can buy canned whole european/Italian summer truffles (Tuber aestivum) year round, we have them for sale right now. Recommended uses: May be used right out of the package, pureed, minced or sliced over pastas, omelets and risottos.